A solar wind stream flowing from the indicated coronal hole should reach Earth on or about August 28th. Credit: NOAA GOES-13. Did you miss the aurora surprise of August 7th? Next time get a wake-up call: Spaceweather PHONE. METEOR MYSTERY: In 1967, NASA's Mariner 4 spacecraft was hit by a surprising flurry of meteoroids--a shower more intense than any Leonid meteor storm. Where did the meteoroids come from? It's been a mystery for 40 years. Now, astronomers may have found a solution. Get the full story from Science@NASA. 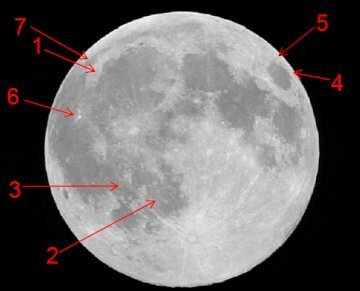 The flashes seen by the Marshall group ranged in brightness from 7th to 9th magnitude, which means they were invisible to the human eye, but easy targets for backyard telescopes. Amateur astronomers are thus invited to join the hunt. 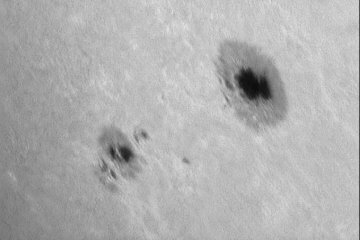 SUNSPOT 905: One of the spots in sunspot group 905 is as big as Earth. Can you guess which one? Above: Sunspot 905 on Aug. 23rd. Photo credit: Dennis Simmons. Although this sunspot group is big, with more than one planet-sized core, it poses little threat for strong solar flares. The sunspot's overarching magnetic field is neither tangled nor twisted enough for violent eruptions. more images: from Guillaume Bertrand of Saint Laurent sur Sèvre, France; from Peter Hoebel of Erlangen, Germany; from Gil Esquerdo of Tucson, Arizona; from Robert Arnold on the Isle of Skye, Scotland; from Simon Krulec of Celje, Slovenia; from Jan Timmermans of Valkenswaard, The Netherlands; from John C McConnell of Maghaberry Northern Ireland.